A group Russian and American WWII-era warplane enthusiasts looking to commemorate the joint Soviet-Allied victory over Nazi Germany have decided to revive the Alaska-Siberia air route once used to ferry American warplanes to the USSR under the Lend-Lease program, flying several war-vintage aircraft from Great Falls, Montana all the way to Siberia. 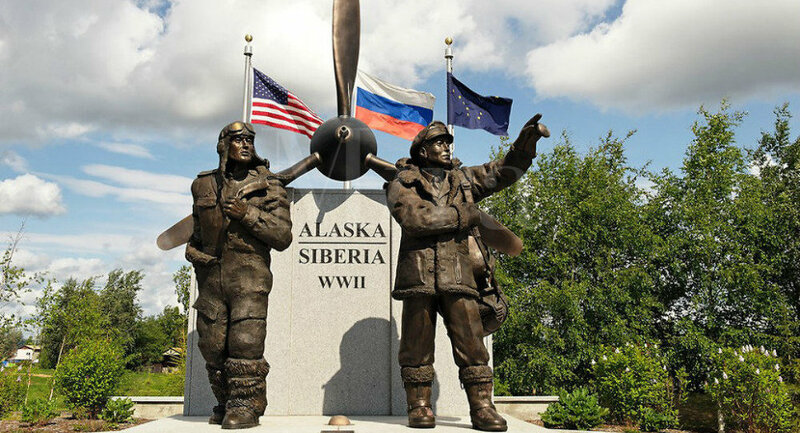 The event, called Alaska-Siberia 2015, is being held in cooperation between Russian aviation company Rusavia and the US non-profit Bravo 369 Flight Foundation, recreating the famous air route used by US and Soviet pilots from 1942-1945 which sent nearly 8,000 aircraft to the Soviet Union under the Lend-Lease program. Launching from Great Falls, Montana on Monday, two Douglas C-47 transport aircraft purchased by Rusavia will make the 9,700 km trip all the way to Krasnoyarsk, Siberia, accompanied to Alaska by a group of North American Aviation T-6 Texan trainer aircraft. Piloted by Russian, American and Canadian crews, the Douglas C-47s will arrive in Alaska at the end of the month, crossing the Bering Strait July 27-28, and arriving in Krasnoyarsk on August 4. After that, the planes will continue on to Moscow, ending up at the MAKS-2015 aviation show, set to open August 25. Commenting on the historic reenactment, Bravo 369 president Jeff Geer told Russian media that his team is eager "to shake hands with our Russian colleagues" and to show "the historical and cultural closeness of our two peoples." Bravo 369 is filming the event, and plans on releasing a documentary about the harrowing route, and the reenactment devoted to it, known as 'Warplanes to Siberia'. Earlier this year, Geer told Russia's RBTH that his group was surprised to find that "very few people…have ever heard of ALSIB or know of its importance during World War II." The trip, and Bravo 369's documentary aims to change all that. The history behind the wartime route is just as interesting as the historical flight recreating it. As Bravo 369's website explains, Woman's Air Force Service Pilots (WASP) would fly planes from factories all across the US to Great Falls, Montana, where the 7th Ferrying Group would take over, flying them up through Canada before arriving in Fairbanks Alaska, where Soviet pilots would take over and take them the rest of the way. The route was long-classified top secret due to the Soviet Union's neutrality agreement with Japan. Flights took a total of up to 33 days to complete. In Krasnoyarsk, the aircraft would be distributed to the front lines in Eastern Europe. Via ALSIB, the US Lend-Lease Program provided Russia with nearly 8,000 aircraft. The route was extremely dangerous, pilots facing treacherous conditions, extreme cold (down to as low as —60 degrees Celsius) and other issues. On the American side, ferry pilots often had as little as 40 hours of flight time, forcing them to fly in groups along with more experienced pilots. A total of 177 aircraft flying along the route never made it to the front lines. Nearly 8,000 aircraft were sent to the Soviet Union via the Great Falls, Montana – Krasnoyarsk, Siberia route, including over 2,600 Bell P-39 Aircobra fighters, nearly 2,400 Bell P-63 Kingcobra fighters, over 1,350 Douglas A-20 Boston/Havoc attack light bombers, over 730 North American Aviation B-25 Mitchell bombers, and over 700 Douglas C-47 Skytrain transports. The air route was established a year after US President Franklin Roosevelt decided to extend the Lend-Lease Act to the Soviet Union. Between 1941 and 1945, the US would provide the Soviet war effort with nearly half a million vehicles, 2 million tons of fuel and nearly 4.5 million tons of food.